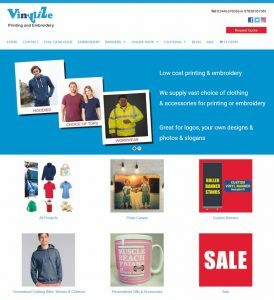 We were delighted to be asked to build an ecommerce website for Vinylize Printing & Embroidery who are located in Barry in the Vale of Glamorgan. Vinylize specialise in a range of products including custom printing of t shirts, hoodies, banners, roller banner stands and canvas prints. They also embroider clothing for sports teams and businesses. We worked closely with owner Tony Peters to understand the needs of his business. With a vast range of thousands of products, it was decided to focus upon his best sellers for his first website. The site was built using WordPress which means that Tony and his team can update themselves easily and they can add unlimited products and categories in the future. We also provided the initial SEO work which resulted in the website appearing at the top of Google for target key phrases within a week of the launch which is a great start.